JUST WHAT YOU'VE BEEN WAITING FOR!! 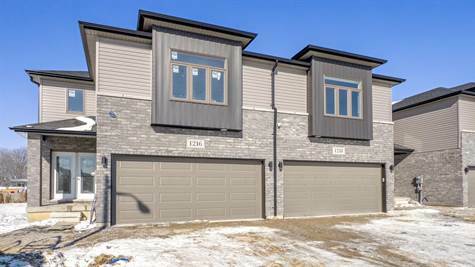 BRAND NEW END UNIT LUXURY MODERN - STYLISH TOWNHOMES 2 STOREY STYLE IN DESIRABLE DEVONSHIRE HEIGHTS RIGHT BEHIND DEVONSHIRE MALL! GREAT CURB APPEAL, FULL STONE/BRICK - LRG INVITING FOYER LEADS YOU TO THE OPEN CONCEPT MAIN LVL W/COFFERED CEILINGS. LRG EAT-IN KITCHEN W/UPGRADED CABINETS & NICE W-IN PANTRY. OPEN CONCEPT LIV RM/DIN RM, 3 BDRMS & 2.5 FULL BATHS TOTAL. LAVISH ENSUITE & W-IN CLST. BSMNT MAY BE FULLY FINISHED W/ADDT'L WITH 4TH BEDROOM & LRG REC RM AREA! 2 CAR GARAGE - HIGH QUALITY FINISHES THRU-OUT. COME HAVE A LOOK TODAY! PEACE OF MIND W/7 YRS OF NEW HOME WARRANTY W/TARION!! CLOSE TO EVERYTHING, WALK TO DEVONSHIRE MALL! !